I want to congratulate Denise LaBarre on her most phenomenally written book, “Issues in Your Tissues.” What a brilliant read and what a brilliantly clever intuitive person. I needed some healing and Denise’s name jumped out at me from a list of healers on Maui. I picked up a copy of her book at a local bookstore to prepare myself for this “health catalyst”, wondering what that meant. Her book startled me with the realization that I had forgotten how to breathe! That simple re-training of breathing started a shift, physically and emotionally. I was standing taller, and found the waves of daily frustration and exhaustion weren’t washing over me as often. By the time I met Denise for our appointment, I was ready for anything! Denise met me with a calm kindness that enveloped me in comfort and I trusted that I could open up to her without any judgement. Her ability to hear my body was spot-on. After some talk and bodywork, we shifted into a process that released pent up anger that had plagued me for years. Denise gave me the tools to access these buried feelings that had kept me from feeling the light and love that surrounded me. We finished our sessions with a Power Circle Ceremony. The power circle consisted of gathering toys, rocks, and other objects from around her home that symbolized something significant for me. She showed me examples of other people’s circles but they didn’t particularly speak to me. When I did my own though, I had the final shift that melted the emotional traps that had ensnared me in a 10-year downward spiral that culminated in cancer. As I placed my feet in that circle I had built full of meaning, I felt a wave of strength flood my being and I felt reassured that my journey was far from complete. Cancer wouldn’t take me and I still have a lot to give. As I opened my eyes, I realized that I had the power all along. Denise has this breathtaking ability to hand you the tools needed to break the rock walls that block out your brighter, bolder life. I tried to thank her for the gift she gave me, and she reminded me that I was the one that did the hard work. 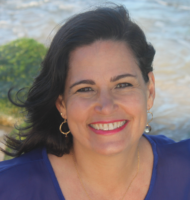 I recommend Denise to anyone that realizes they want the life of their wildest dreams, the life that is worth living for, one deep breath at a time! I met you just after the Maui Marathon, seeking relief from sore legs but finding relief from a sore soul instead. I am the writer who had never been in love. Your book is wonderful. The first story I opened is the one of the lady who was abused as a child. The concepts you used to help her reminds me of the ones I need to remember. So simple, so important, they are the basics of our being. You have a great mission field for which you are willing to use your God-given gift. Thank you for your willingness to help others! This Book is A Work of Art! 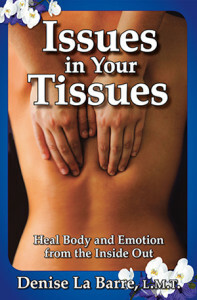 Issues in Your Tissues Should be a Best Seller! I am loving your book. You are a gifted writer and intuitive person. I found the story about you “asking” for your next client and the African American woman giving you knowledge (without her realizing it) incredible. Also, the stories mixed with advice is similar to how I put my book together. It is wonderful. One day I will book a massage with you and I will be so blessed! I am cheering from afar for Issues in Your Tissues, which is an absolutely wonderful book. Your style is so fresh and direct that each time I read another piece, I can hear your voice. The images you create and the situations you describe have so deep a texture of authenticity that there are times when I find myself crying and other times when I’m laughing out loud. I can’t wait to get my massage therapist – daughter’s reaction when she comes home in a couple of weeks! The energy of healing and recovery that you generate is palpable, and has brought me much joy, too. Bless you! I knew my body was trying to communicate with me, but I was not able or perhaps even willing to put it into words. Denise, with spot-on accuracy, brought those feelings to the front and into words that helped my body sigh and say, “finally!” I felt taller when I walked out her door. Working with you is the best thing I’ve ever done. After my session I treated myself to a smoothie to tell myself, I can do it!! I feel like I’ve never felt before…ALL GOOD! I think I had an out of body experience. Or else I’ve simply dropped off soooo much of my load of grief that the world feels completely new. I feel like a new woman! Miraculous and Life-changing. My heart is so happy. I have never met anyone that I believed in what they were doing as much as I believe in Denise and her work. I do not say that lightly. Its like the flood gates have been open. I thank God for Denise. My time with Denise was miraculous and life-changing. My heart is so happy. Everyday I have new insights. When I left Alaska to come to Maui for my sessions, I weighed 178-180. Today I weighed 162 lbs. That seems like a lot of weight to loose in 2 weeks but I realized that was emotional weight. The shift happened when I released my anger and fear during my second session. I know it because not only did I feel stronger and powerful, but I felt lighter. The burden was lifted. It was like my fat was storing it. Now that it can, my body is quickly letting it go. I love all of this so much that I can hardly contain myself. I love that I met Denise and love being a healing catalyst. It is all so right. After seeing you, Denise, I began every morning by talking to my inner 5 year old, saying, “Let’s go and have some fun today.” It was weird because I’ve never believed in that kind of thing before but this time gave it a go. I noticed that the pain in my shoulder blades started to diminish, then slowly I would get random days waking up with no pain at all. It felt great. Since I returned home to Perth at the end of November, I have had 4 weeks of waking up with no shoulder blade pain or spasms at all! It is so wonderful, especially after 12 months of trying different types of treatments that didn’t seem to help and I was feeling frustrated. I just wanted to let you know that your treatment did in fact help me greatly. It seemed it needed time rather than to work instantly (I must learn to be more patient instead of wanting to feel instant results). Thank you for your wonderful healing abilities. ~ Lisa M, Travel Blogger, Australia. I came to you with chronic pain in my hip, suffering for years on and off. It had become unbearable. I knew I was working through some past events that had felt unresolved, and had a sense you could be helpful with this. I had an intuitive sense that the pain was connected somehow. Your methods were sometimes strange but I played along anyway. I was given a “safe space” to share and felt I heard without judgment. I left feeling a lightness and the pain had left me. I arrived home to a hot lavender bath, and slept for the first time in a VERY long time through the night pain free. I woke up with surprise and gratitude. I have had lots of different types of bodywork and have had relief only to have it return during the night. What has happened since then has not been a miracle but a tapping into my emotional pain that has disguised itself as physical pain. Denise, you helped me release that, and unlike all the other therapists gave me tools to teach me to continue to “release” the pain myself. Has the pain returned, yes. But without the intensity it had before, and I am able to breathe into it and it disappears again. I have no doubt with time my body will be able to “remember” to release on it’s own. Paying attention to how I hang onto stress and “triggers” and where I felt it and then breathing into it instead of fighting it is a wonderful tool, that seems so simple yet so powerful. Thank you from the bottom of my heart for helping me with this. Thank you, you have a beautiful gift. Thanks for sharing it with me! I am so grateful to have met Denise and to have experienced two amazing healing sessions! My body, especially my shoulders and neck, were transformed from armor to soft and relaxed tissue as I released emotional blockages, tears, needing to overwork to feel good enough, unresolved grief and loss, and physical and emotional healing from damage related to cancer and treatments. I enjoyed sharing and laughter about love and relationships and reconnecting with my little Colleen and “hot” 20-year-old Colleen!  I would love to have more sessions.